Reynolda House is one of the great treasures of the Wake Forest campus. It’s a historic home and an exceptional museum of American art, all within walking distance of the campus – and free for your students. This is a place well worth discovering – great idea for parents during Family Weekend or any time you are visiting. We are very fortunate to have one of the members of the Reynolds family, Barbara Babcock Millhouse, who is very involved in the museum and its place in Winston-Salem history and art history. Last week there was an event at Reynolda House where Barbara Babcock Millhouse discussed her new pictorial history, Reynolda: 1906–1924, which chronicles the Reynolda estate from 1906–1924, the formative and active years of the working estate and model farm. Years of research have led to numerous discoveries about the estate—the family home and gardens, experimental farm, village, and woodlands. The book will be a significant addition to the literature about the Country Place Era. Millhouse, founding president of the Museum, is also the author of American Wilderness: The Story of the Hudson River School of Painting. 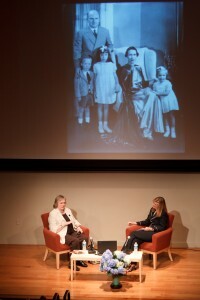 To celebrate the publication of the book, Reynolda House presented a conversation between Millhouse and Michele Gillespie, Kahle Family Associate Professor of History at Wake Forest, seen in the photo here. For families of history majors (or even students just looking for a great history class), I highly recommend Dr. Gillespie. She is an energetic, innovative professor who specializes in the history of the South, and she is a sought-after speaker for alumni and parent groups. She is the epitome of our ‘teacher-scholar ideal’ – so tell your students to look into her classes as they plan their schedules.